When taking the family to the cottage, to go exploring various parts of the country or to go on a camping trip, it often requires more space than we might have in the SUV or mini-van. To add more cargo space to our vehicles or bring our favourite toys to enjoy the outdoors, many of us might use vehicle racks and hitch mounted carriers. 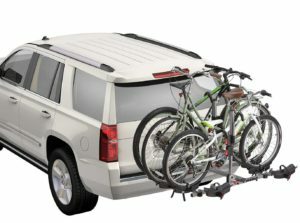 Some of the typical vehicle add-ons include a roof rack with add on carriers or racks or hitch mounted carriers and racks. There are a wide variety of options to deck out vehicles with the space to carry our favourite toys to our favourite spots around the country. Being able to enjoy the outdoors and the serenity that these remote locations afford us while staying active together is the main motivation of many families to leverage vehicle rack systems. Throughout the summer and even winter months, we’ll want to haul out these carriers and racks with us to our weekend adventures and then, store them away during the week. Finding a way to minimize the work of storing and mounting the rack systems to our vehicles helps us get away on short notice while keeping our garage storage system organized. A great way to do this is to match up garage storage racks and slatwall organization systems with your vehicle’s racks and mountings systems. Matching them up and installing them in the appropriate places within the garage means we can make use these vehicle racks with more ease. If we plan it out, we can set it up so that we don’t need to be especially tall or overly strong to move these bulky carriers or return outdoor toys to where they should be stored. Just because our weekends are packed with high energy activities doesn’t mean that putting things away needs to be just as challenging. A good garage renovation will provide a system where mounting these vehicle carriers will flow easily from the garage storage area to the vehicle itself. 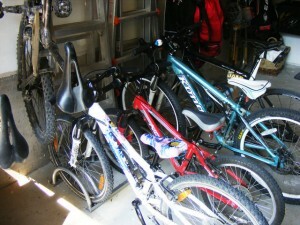 From a vehicle rack, bikes can be mounted easily onto hydraulic bike racks which can be lifted up and out of the way. While there are many types of bicycle racks including wall mount, floor mount or ceiling mount, the lift racks may be the best suited to work with vehicle racks or mounts. Firstly, they can be placed to be located at the rear of the vehicle so it’s easy to transfer the bikes between the vehicle rack and the overhead lift racks for bikes, golf clubs, snowboads and other sports equipment. Next, if you have a hydraulic overhead lift, after you’ve loaded a few bikes and a couple of sets of golf clubs, it takes the mere push of a button to get the rack to lift up into the overhead storage space of the garage. 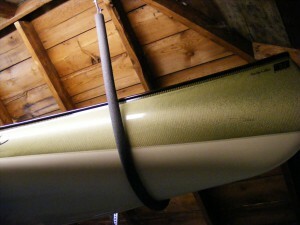 For canoes and kayaks, they are often mounted on the vehicle with a J-rack or other roof rack system. With an overhead sling and pulley system in the garage which is positioned directly over the roof of the vehicle, the kayaks and canoes can be stored in the overhead space. By attaching the sling around each kayak or canoe and releasing the vehicle rack mechanisms, the kayaks can be lifted directly up into the rafters of the garage until it’s time to retrieve them for the next adventure on our favourite rivers, lakes or oceans. 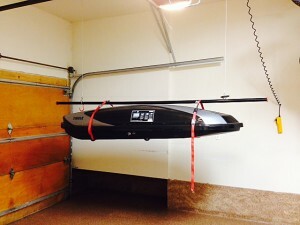 For cargo carriers located either on the roof of a vehicle or off the rear hitch of the vehicle, overhead systems similar to the bike or kayak storage lift systems make putting things away so much easier after a long trip. With slings and a hydraulic lift system, these carriers can be lifted up and away. Whether you intend to store them empty or pre-packed with some standard camping or adventure gear, the overhead cargo carrier storage makes it so much easier to prepare for the next driving trip. Turning the garage into a storage system to ease the packing and unpacking of the vehicle racks means we can reduce the strain of moving larger awkwardly shaped carriers and outdoor toys. A little bit of planning and a garage renovation will make it easy to move items from the vehicle to its storage location in the garage and back again. If you need assistance to create this handy system, a complimentary in-home consultation is available to guide you through a process to outfit your garage storage systems to your lifestyle. Now that summer is here, the kids will be home all day. Of course, they’ll want to be outside with all the warm sunny days ahead. Getting on their bikes, scooters, skateboards and other toys to get to the local park or their friend’s house is the typical response to enjoy a play day or play date with a friend. From the bikes and skateboards to the soccer balls, basketballs, water toys as well as strollers and other toys for the younger children, the garage soon becomes home base to everything the kids need to enjoy the outdoors. For the active family, the garage renovation would provide garage storage solutions incorporating ways for the garage to be used by the entire family for a fun filled summer. This also includes the big kids in the family with places to access golf clubs, tennis racquets, mountain bikes and kayaks. Whatever your lifestyle, making it easy to access your outdoor sports equipment or toys is just as important as keeping them out of the reach of younger children. With some of the bulkier outdoor equipment such as kayaks, stand-up paddleboards and mountain bikes, you’ll want them handy and easy to mount and dismount from a Thule or Yakima rack system for your vehicle. The overhead hydraulic racks or lifts are ideal for transferring these pieces of equipment to or from your vehicle with a minimal of effort. 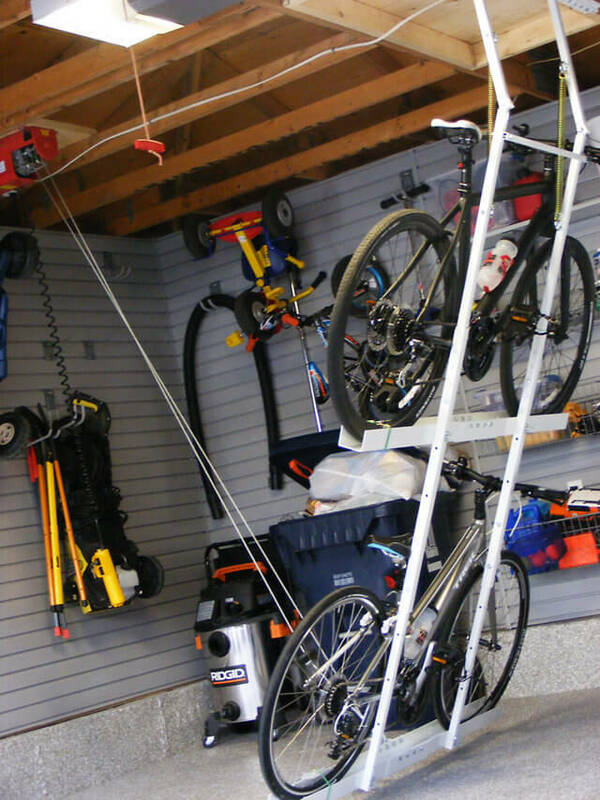 By positioning the racks at the right spot within the garage, equipment can be lowered directly onto the vehicle’s rack while it is parked in the garage. Reduce the awkward movements and stress on your back or body needed to mount the cargo box and other gear within the confines of the garage space. Plan out garage storage systems that facilitate the packing and unpacking process of the vehicle. 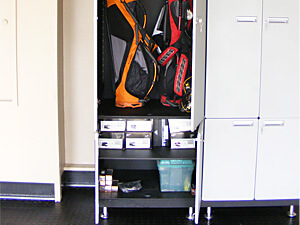 Now, for things such as an expensive set of golf clubs, you might opt to have lockable garage cabinets. They will safely and securely store more expensive items which cannot afford to be knocked about by the kids, their bicycles or other toys as they move about the garage accessing or putting away their summertime toys throughout the summer.. The slatwall organization systems are so durable, versatile and modular, not only are they great for garden tools and lawn mowers, but they can also be used for a variety of kids toys. 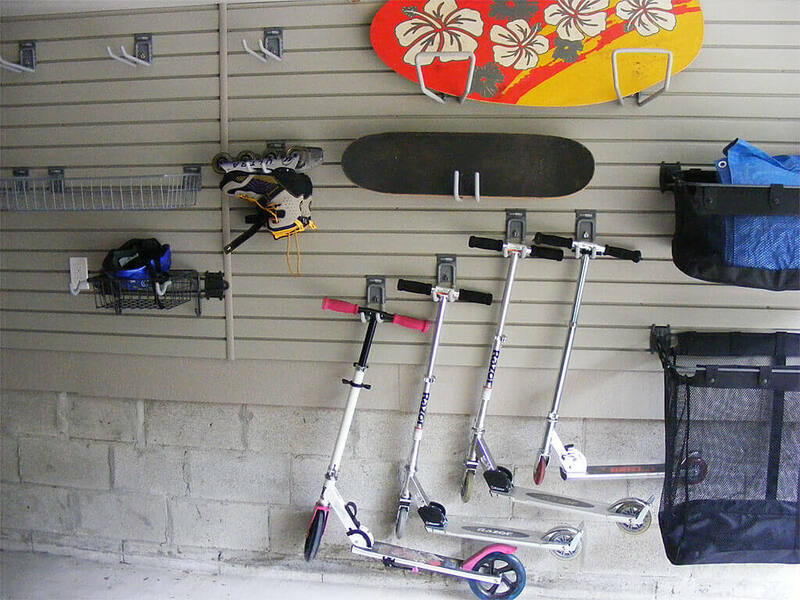 For younger children, mount hooks at lower levels so they can mount their own scooters, skateboards, bats, racquets, clubs and bikes off the ground and out of the way of the vehicles which will be parking inside the garage at the end of the day. Also, there are some great basket systems where all the basketballs, footballs, soccer balls, baseball gloves and other toys can just be tossed into mesh net or wire net basket. By evaluating the kids’ favourite activities and the space available in the garage, the right combination of hooks and baskets will make any slatwall space an effective storage area for everything your kids will want to do throughout the summer. Bicycle usage is back on the rise again these days for everyone in the family. Kids love riding their bikes to visit friends or to go on a neighbourhood adventure with friends. When all the neighbourhood kids ride back to your house for a lunch break, they just ride up, jump off and run inside to satisfy their hungry bellies after a fun filled morning of activity. Give kids a place to park their bikes. This helps them learn how to put things away in the proper place. 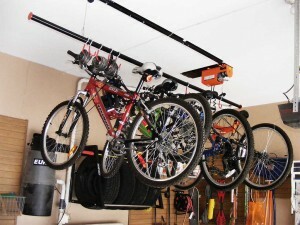 Overhead racks, slatwall hooks and other storage systems are great for the overnight storage of bikes. For summer, a floor rack where kids can park their bike means they leave their bikes standing. 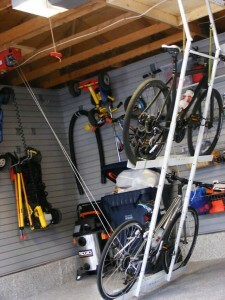 They can avoid having bikes strewn all over the garage floor. 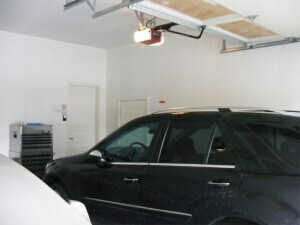 This keeps it easy to maintain the organization of the garage and prevents damage by vehicles driving into the garage . It also gives the kids a reasonable way of being able to put things away in the proper place within the garage. When the lifestyle of the whole family is considered, we are able to design the right combination of storage options so that the space can be optimized and utilized fully. The garage spaces can accommodate both off-season storage and easy access to summertime toys and gear which are used regularly. When you need the entire garage space to work well for everyone, consider a garage design that allows the family to leverage the space for maximum enjoyment of the warm sunny summer days ahead. 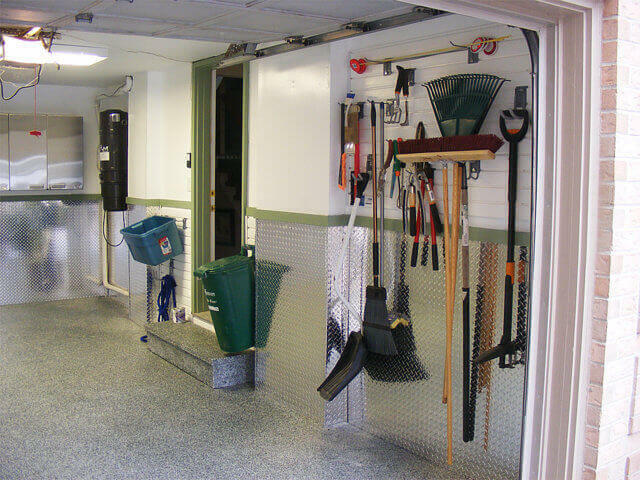 Garages are a great way to use the space effectively for storing a wide variety of household items from garden tools to sports equipment to winter tires. The main concern, of course, is to find a place for all these items in the garage while keeping the vehicles safe as they are being driven in and out as well as parked inside the garage. The walls of a garage may be made of cement blocks, brick and for some newer homes, drywall. It’s not easy to work with some of these types of walls. 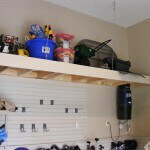 Not only are some garage walls difficult to work with but mounting shelves so it can carry the weight of heavy items. We want to prevent things from falling off and damaging the vehicles or worse, injuring family members. Am I ready for a Do It Yourself Garage Renovation? The garage is one of the more complex rooms in the entire house. If you’ve just purchased your first set of tools, this is likely not the project for you to tackle. Some of the building materials and dimensions of the space can be more challenging than the typical room found inside the house. Some of us have very talented hands-on people in our family. They may even be professionals with related skills. However, not all professionals may have the time to spare to work their own homes in a timely manner. Some professionals are over worked because they are so talented in their field of expertise. If this is your family, consider if the best way for this person to gain a mental reprieve from work is to spend their time off doing something else or whether a garage renovation would be a relaxing past time activity. Many of our garage renovations can be completed in approximately one week, once we start because we have a well-established plan, process and timeline. There are exceptions to this timeline, but a big consideration is keeping the garage renovation time to a minimum so the family may be able to enjoy as much of the summer as possible. While a garage renovation is a great home project, don’t let it take away from your time with your kids during those precious years. Also, don’t let a home project affect your children’s summer experience and enjoyment of the garage as home base to their bikes, scooters, skateboards and other modes of play and transportation. There are no other rooms in the house with the same challenges as the garage. While learning to paint one bedroom gives experience to painting a second bedroom, it’s not the same when it comes to the garage. Renovating the garage has its unique challenges because it is a room directly exposed to the outside and the elements. Knowledge and the experience to complete the task properly the first time means as homeowners, you can enjoy a low maintenance garage for many, many years ahead. The whole family can appreciate the garage instead of having regular garage projects every couple of years which take people away from family time together. 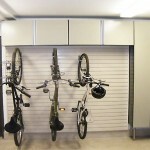 Many of our garage storage solutions last the lifetime of the home when they are applied correctly. We often see other solutions which don’t last or which need regular attention every couple of years. High maintenance items take away from family time because of time and attention needed for regular maintenance. Whether you are ready to renovate your own garage or not, there are some specialty solutions in the garage. 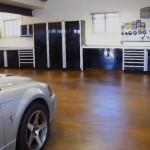 For instance, the preparation and application of garage floor coating takes specialty tools and skills to apply. However, a high quality garage floor such as polyaspartic coating is an item which adds a lot of comfort to the garage while making the floor surface easy to clean up and low maintenance. 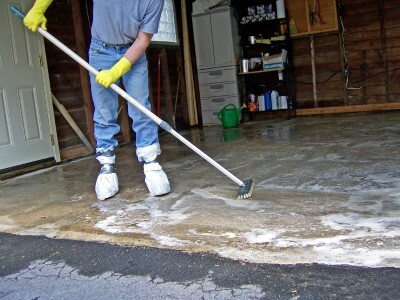 Garage floor coatings require special skills, tools and processes to prepare the cement foundation adequately. Preparing the cement foundation is the key to a successful polyaspartic garage floor coating. The polyaspartic floor coating will not adhere and remain maintenance free for the lifetime of the coating unless the preparation of the cement floor is completed properly. 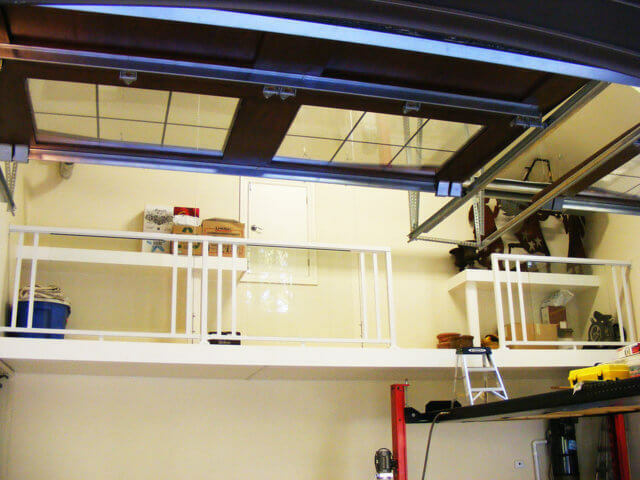 In addition, there are a wide variety of engineering skills used throughout a garage renovation to assure that the mounting of overhead platforms and wall shelving can carry typical loads of 600lb to 800lb per square foot. Safe and secure installations of overhead platforms, racks or shelving are key to assuring that belongings, vehicles as well as family members are protected from any damage or injury. There are no standard dimensions or shapes for garages. 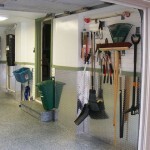 Made to measure solutions give a finished and professional look to the garage. 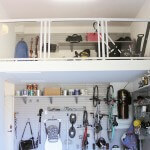 People often want to see end-to-end wall organization systems or garage cabinets. 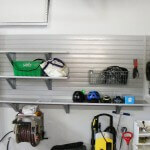 The typical big box store garage storage items or cabinets come in standard sizes and dimensions that are rarely able to accommodate unique dimensions or other challenges which add to the unique space of a garage. These hurdles add challenges which are overcome with Made to Measure solutions that need a little additional preparation. This includes unique sizing of platforms, cabinets and wall systems as well as some special adaptations to the garage space, at times. After overviewing some of the larger challenges that might be found during a renovation, it’s easier to see what would be appropriate for your situation. There are few paths that we find people will take to accomplishing their goal of a functional garage design. The Do It Yourself project is self-explanatory. However, many people with DIY projects get us to complete a garage floor coating, made to measure product installation or a variety of other specialty services. The Do It For Me project is what we find the large majority of people are seeking whether it is a fully finished or a partially finished look as the final goal. To start your project, use our online garage survey tool to assist with a definition of your garage renovation project that best reflects your needs and preferences. The garage survey tool helps people define what they need or don’t need and to start to consider and communicate preferences as well as a plan to fit their garage storage requirements. We provide a complimentary in-home consultation to discuss how you envision your project. After seeing your garage, we introduce additional ideas that you may want to consider. Give yourself a healthy lead time for planning, ordering and installation dates so your family can make the most out of the summer days ahead. A renovation or design project that doesn’t quite end up as you imagined is disappointing. That’s why it’s critical to hire a highly recommended expert who will take measures to learn exactly what you want. A good designer has a variety of design ideas in mind. However, exceptional designers understand that the most critical component of any project is creating a design that fits the distinct needs and preferences of each client. To achieve this, the design expert must ask the right questions and listen carefully to client responses. 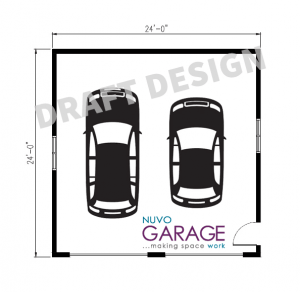 At Nuvo Garage, we tailor each garage renovation to the specific budget, lifestyle needs and design aesthetics of the client. 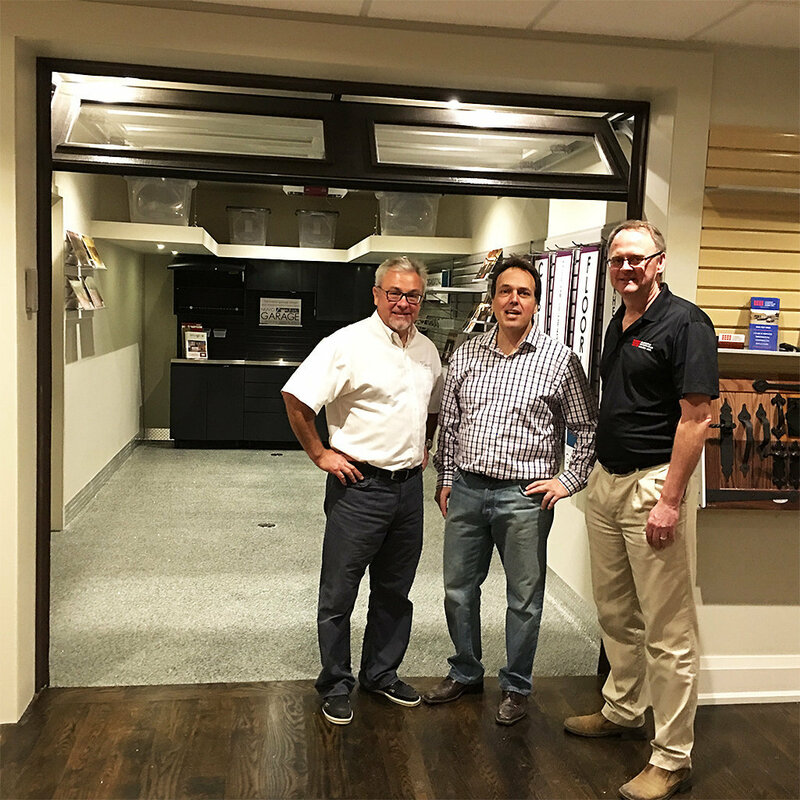 During the initial consultation, I explore the space and talk to perspective clients about how they envision their renovated garage supporting their current lifestyle and any future needs. However, this conversation begins long before I arrive at their door. It starts with six important questions asked on our client consultation request form. Tell me about your garage organization and storage needs. 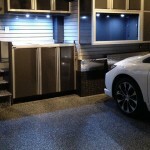 A successful garage renovation is visually appealing and functional. To ensure the design achieves both goals, we start by gaining a thorough understanding of how you plan to use your garage. Think about what is stored in your garage now. Will you require a garbage and recycling station in the garage? Do you need a place to store tools? Will lawn equipment and gardening implements be stored there? What other items do you store in your garage? Is your garage the designated storage space for seasonal decorations or off-season tires? If your family is active, you’ll likely have a variety of sporting goods that require dedicated storage space. The consultation form simply requests that you check off the types of items you want to store. However, the form is also designed to prompt you to think more deeply about how you plan to use your garage, preparing you for our discussion about your lifestyle needs. Tell me a little about your garage. Your garage has a limited amount of space, but our creative and made-to-order storage solutions maximize every square foot available. First, we need to know more about the space. In this section of the questionnaire we ask whether we’re renovating a one, two or three-car garage. You’ll also estimate the height of the ceiling. This gives us a clear idea of how much wall space and overhead space is available for the garage renovation design. Lastly, we need to know more about the existing framework. Is the space drywalled or will we be working with block walls or open wood stud walls? The answer to this question will dictate the application process of certain design elements like wall organization system panels. Tell me a little about your storage style or preferences. In the questionnaire, this is presented as a simple, multiple choice question. Do you prefer to see everything or do you want to keep some things behind closed doors? Yet, this question speaks to the heart of your design. Do you want everything kept on display using baskets, hooks and shelves, or do you prefer the clean lines of hidden storage? When done well, both storage styles can be quite attractive. 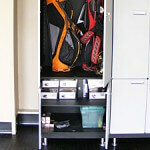 Visibly stored items are quickly and easily accessed. The items themselves can be arranged in a pleasing manner that makes them an integral part of the design. On the other hand, sleek cabinets provide hidden storage, ensuring the renovation design is the star of the show. Now that you’ve had a chance to consider what you’ll be storing in your garage, the available space and the storage style preference, it’s time to address the type of storage you envision for your space. 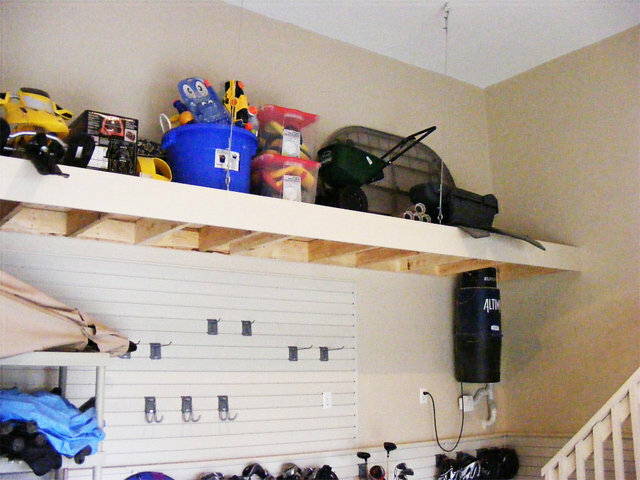 Would you like to see everything stored neatly along the walls of your garage? Would you prefer to store everything overhead, making use of wasted space? 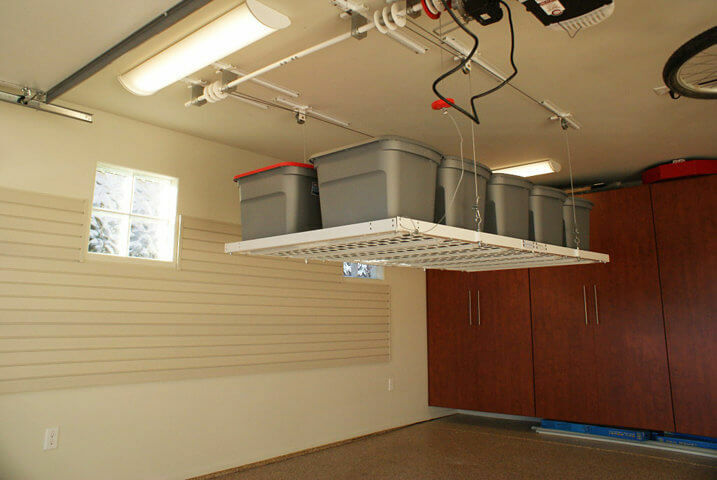 Or would you prefer to combine wall organization and overhead storage to maximize the available storage space in your garage? Whenever possible, it’s ideal to incorporate both wall organization and overhead storage. Wall organization systems make frequently used items like gardening tools and sports equipment easily accessible. Overhead storage racks are perfect for storing large, bulky items like kayaks and infrequently used items like holiday decorations. In this section you’ll also indicate whether you want to include garage cabinetry or lighting options in your renovation design. What level of finish are you interested in? Our garage renovations range from basic garage organization projects to high-end garage renovations. The distinction is in the finishes. If you simply want to transform a cluttered garage into an organized space you’ll enjoy returning to each night, you may opt to bypass the finishes. 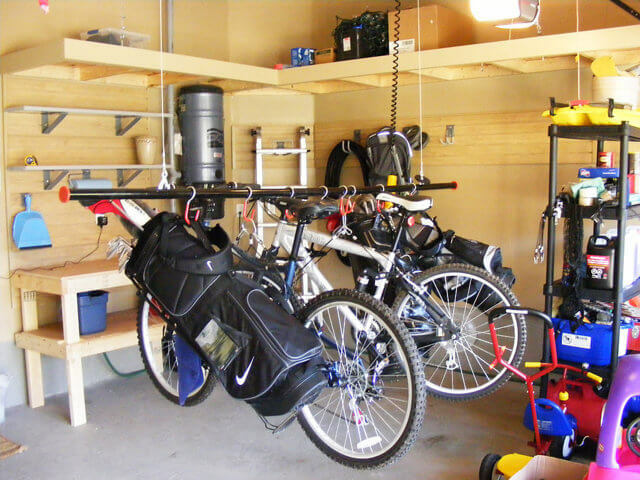 You’ll still have an organized garage that looks great and does everything you need it to do. For functional reasons, like preserving your garage floor and discouraging stains, you might select one of our garage flooring options. 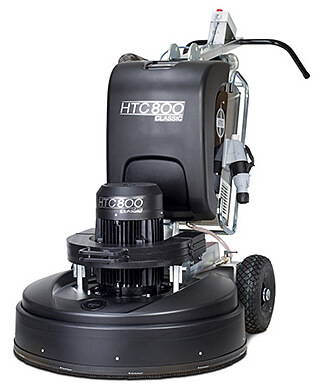 These include our one-day polyaspartic flooring system and modular, interlocking floor tiles—which can be scrubbed clean or replaced if damaged. For clients seeking to transform their garage into a contemporary showplace, we can incorporate a number of finishes to get the look you want. Drywall, painting and beautiful polyaspartic flooring—available in a variety of stunning colors—pair nicely with Canadian-made garage cabinetry designed in a sleek, European style to create an impressive space. What is the budget for your garage renovation? The last key question about the design deals with your budget. The array of design and finish options available represent vastly different costs. I suggest that clients establish a budgetary range. The bottom number should be what you’d ideally like to spend on the project. The top number is what you’d be willing to spend to get the look and function you desire. Creating a budget range will allow us to develop design options that address your lifestyle and storage needs without going over your budget. Are you ready to transform your garage into an organized, functional space or a fabulous showplace where you can park your vehicles and store all the things your lifestyle requires? 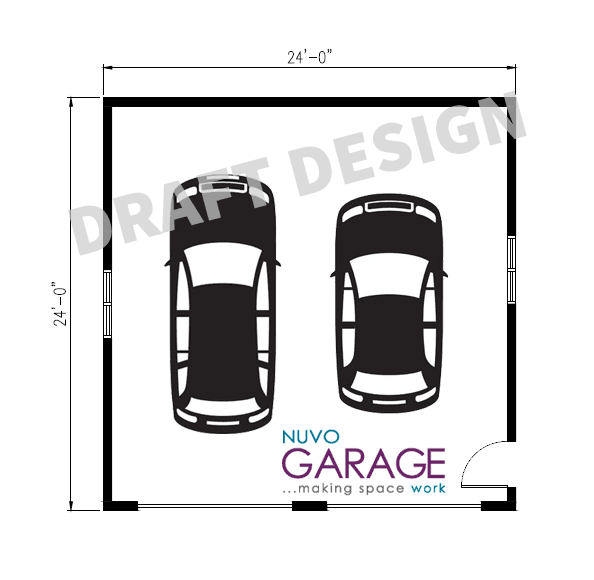 Complete the Nuvo Garage consultation request form and begin the journey to your best garage renovation. Is insulating your garage a worthwhile investment? Customers are often shocked by this question. The garage is one of the most insidious energy vampires in a home. 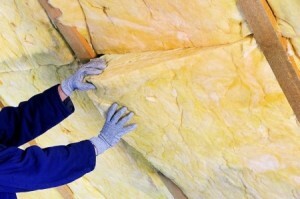 Insulation, by its very nature, impedes costly heat loss. So how could adding insulation to your garage not be beneficial? How the space will be used. The age of your home and whether it already has some insulation is a primary consideration. Older homes tend not to have any insulation. Installing it requires starting from scratch—a costly prospect. Newer builds usually have some insulation. However, it doesn’t always extend to exterior walls. The effectiveness of the insulation is dependent upon the quality of the product used. Next, consider what you hope to accomplish by adding insulation. If you anticipate that insulation alone will raise the frigid temperature of your garage to one comparable to the interior of your home, you’ll be sorely disappointed. If, however, you simply want to raise the temperature of the garage interior several degrees, fully insulating the space may be the perfect solution. Lastly, there is the matter of how you intend to use the space. If you’d like for your garage to be a bit cozier because you’re housing a collection of vintage automobiles, insulation alone may do the trick. If the space will serve as an extension of your home’s current living space, more than insulation alone will be needed. There is a room above the garage that is consistently several degrees cooler the rest of the home. The homeowner wants to protect a collection of vintage or exotic cars from the harsh winter temperatures. 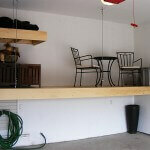 The customer would like to expand the home’s living space by setting up a workshop in the garage. Each situation must be assessed on the three criteria listed earlier: the state of the garage; what the homeowner wishes to accomplish; and how the space will be used. Let’s take a moment to break down each scenario. Take a moment and think about your garage space. There are uninsulated exterior walls (including the garage door itself). Additionally, the garage door is opened several times each day, allowing any warmth inside the garage to escape and be replaced by colder air. As a result, the garage is nearly as cold as the outdoors in winter. How does this affect any living space over the garage? The science of thermodynamics tells us that two spaces which interact will eventually reach thermal equilibrium, or equal temperature. 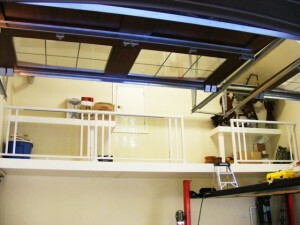 In this case the two spaces interacting are the interior of your garage and the bedroom above it. The heat from the bedroom elevates the temperature of the garage while the chilled garage air lowers the temperature of the bedroom. Seems like an open and shut case for insulation, but is it? Adding insulation will stem the loss of energy in the bedroom. However, insulation alone will not increase the temperature of the bedroom to the level of the other rooms in your home. 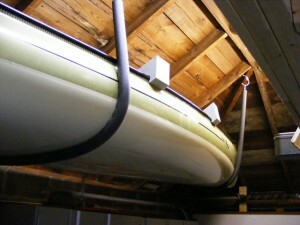 The extensive scope of work required to fully insulate the garage must also be considered. This may include insulating all exterior walls; insulating the garage ceiling; replacing the drafty garage door seal; and replacing the garage door with a highly-insulated model. This all comes at considerable cost. Insulating the garage offers marginal heat benefit to the bedroom above. On the other hand, installing a baseboard heater in the bedroom is typically more cost effective. Investigate other options that will reduce your overall heating bill, like replacing drafty windows in the bedroom and elsewhere in the home. These methods are more efficient and offer a larger heat benefit than insulating the garage. Frigid temperatures can be tough on your car. The vehicle’s paint is vulnerable in colder temperatures. When oil and other lubricants get extremely cold, the engine and other systems are negatively impacted. A warmer garage not only protects your vehicles, it makes starting them much easier on cold winter mornings. Not surprisingly, classic car enthusiasts often insulate their garages. The cost of thorough insulation, as described above, can be substantial. However, when you have a considerable investment to protect, the expense is worthwhile. 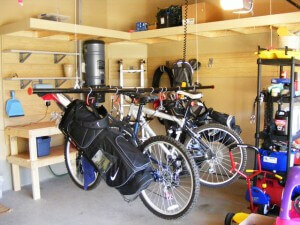 What if your garage is only used to store lawn furniture, recreational equipment and tools? The expense of insulation may not add up. Whether it makes sense for you depends on the cost, heat benefit and the value that you place on warming your garage. 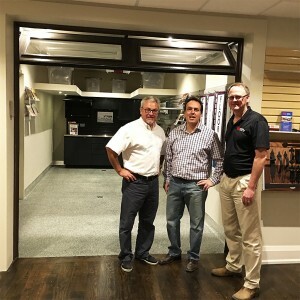 When you think of a garage renovation do you envision a handy new workshop or a man cave complete with state-of-the-art electronics? Extending your home’s living space not only provides enjoyment for you and your family, it can significantly increase the resale value of your home. However, insulating the garage is just the first step. Insulation is designed to retain heat, so the insulated space will be warmer. However, insulation alone won’t transform your frosty garage into a cozy living or work space. If you plan to convert your garage to usable living space during the winter, a more active measure is required. A heat source, such as an electric or gas heater, must also be installed to make the space comfortable year-round. The best way to determine whether to insulate or not to insulate is by doing a cost benefit analysis. A garage renovation specialist can help you estimate the cost of insulating and/or heating your garage and any adjacent rooms. An experienced professional will also help you assess other factors, like estimated temperature improvement and heating and cooling costs. Once you fully understand the realities of what insulation can and cannot do for your space, you can confidently make the decision that is best for you.